The idea for this commissioned painting was inspired by Annie’s story about her son, James. An American living in England, James is married to PJ, another man who is not a US citizen. As gay marriage is not recognized by US Immigration, they cannot return here without his husband risking deportation. If he were married to a woman, it would not be an issue. 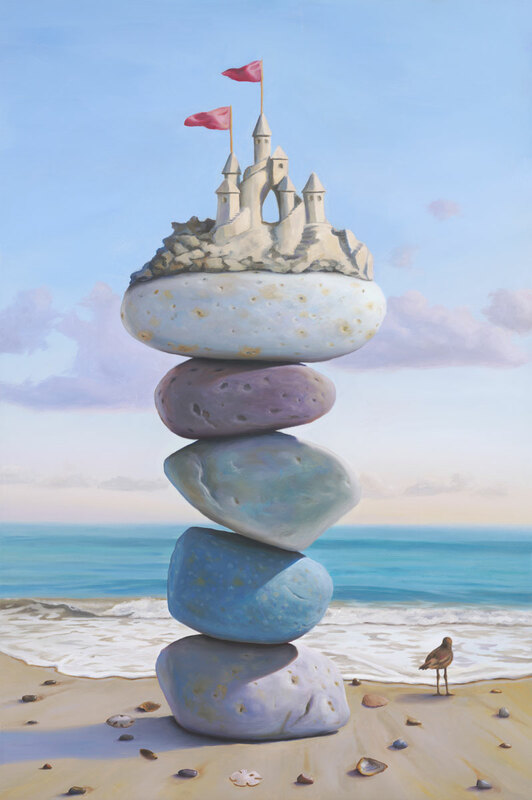 The sand castle (which he loved making as a child) symbolizes the ideal world that would allow her James and PJ to return to his home country- one in which all unions of love will be treated equally and with the same reverence. A world that we are all waiting for and creating. And the bird gazing across the sea represents Annie longing for her son to return home.